There's Darwin, perched on the slopes of the Darwin Hills. The Argus Range rises to the east behind the hills, with the Panamint Valley tucked on the other side. The tall peaks in the background are in the Panamint Range, topped by Telescope Peak. Death Valley lies on the eastern side of the Panamints. Darwin is sometimes described as being "in Death Valley." That's obviously a bit of a stretch. 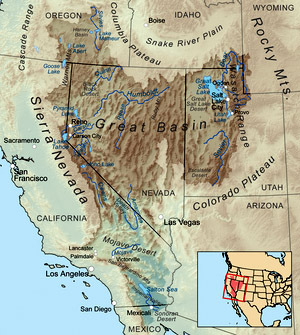 _The photo above exemplifies the terrain of the Great Basin, a series of valleys separated by mountain ranges running roughly north and south. This huge expanse of desert--the largest in the United States—is called a basin because none of its waters find their way to the sea, but rather evaporate, sink into the ground, or flow into lakes within its confines. We're also at the northern edge of the Mojave Desert. The Joshua tree is the indicator species of the Mojave, and the desert surrounding Darwin has a healthy population of Joshua trees. The Coso Mountains rise to the south and west of Darwin. The Cosos are the home of an extensive and spectacular collection of Native American rock art. 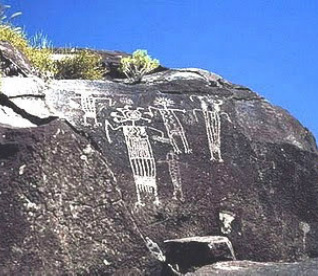 Because much of the Coso Range lies within the China Lake Naval Air Weapons Station, these petroglyphs have been protected from vandalism. 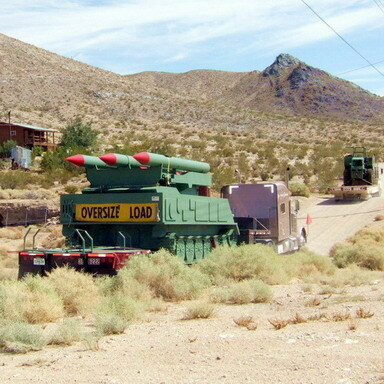 Tours to some of the petroglyph sites are available by reservation through the Maturango Museum in Ridgecrest.